The art of memorization is a long-standing tradition at Dayspring Christian Academy. From Kindergarten to Senior year the memorization of poetry, the Mayflower Compact, the preamble to the Constitution, the Gettysburg Address, the Apostles Creed (in English and Latin), monthly scripture passages (in English, Latin, and Spanish), the Greek Alphabet, student orations, and more, is an unquestioned assumption. Despite the groaning that occurs at the ground level of this expectation, Dayspring stands by the practice, and understands the value, both temporal and eternal, of committing information to memory. Modern “Progressive Education” denies the value of rote memorization. Michael Beran, in an article written for the publication City Journal, quotes a progressive Ph.D. as asserting, “For progressive educators, to require students to recite ‘Daffodils’ or memorize the Gettysburg Address is a relic of a ‘drill and kill’ culture that inhibits the development of the self and is the educational equivalent of a chain gang.” So is Dayspring “drilling and killing” its students by requiring them to memorize information? Is the memorization of passages interning them in an educational “chain gang?” We deny this claim on the basis of proven history. Dayspring holds to the assertion that memorization of excellent literature is a hallmark of a distinct and exceptional education. The pain of the process is refining, and the retained knowledge edifying and relevant to future excellence in life. Memorization provides exercise for the mind. This is the reason schools used to require students to memorize poems, Bible verses, famous speeches, etc. The true advantage of such exercise is that it generates mental industriousness. Any teacher will tell you that many students today are mentally lazy. Memorization also trains the mind to pay attention and focus intensely. Such skill also seems to be lacking in many youngsters, which is most obvious in the growing number of kids diagnosed with ADHD. Besides the temporal benefits, there is an eternal motive behind Dayspring’s ascription to the practice of memorization: the meditation on Scripture. 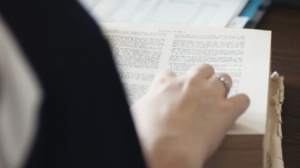 Each morning, every student at Dayspring declares a pledge to the Bible, where Psalm 119:11 is recited in the form of a promise: “I will hide (the Bible’s) words in my heart that I might not sin against God.” Dayspring takes this pledge seriously, requiring the school-wide memorization of scripture. Why does Dayspring require more than the mere reading of scripture? Because God commands it for our good and his glory! Joshua 1:8—This Book of the Law shall not depart from your mouth, but you shall meditate on it day and night, so that you may be careful to do according to all that is written in it. For then you will make your way prosperous, and then you will have good success. Deuteronomy 11:18—You shall therefore lay up these words of mine in your heart and in your soul, and you shall bind them as a sign on your hand, and they shall be as frontlets between your eyes. Psalm 119:9—How can a young man keep his way pure? By guarding it according to your word. Colossians 3:16—Let the word of Christ dwell in you richly, teaching and admonishing one another in all wisdom, singing psalms and hymns and spiritual songs, with thankfulness in your hearts to God. Psalm 1:1-3—Blessed is the man who walks not in the counsel of the wicked, nor stands in the way of sinners, nor sits in the seat of scoffers; but his delight is in the law of the Lord, and on his law he meditates day and night. He is like a tree planted by streams of water that yields its fruit in its season, and its leaf does not wither. In all that he does, he prospers. Jeremiah 15:16—Your words were found, and I ate them, and your words became to me a joy and the delight of my heart, for I am called by your name, O Lord, God of hosts. Proverbs 6:21-22—Bind them on your heart always; tie them around your neck. When you walk, they will lead you; when you lie down, they will watch over you; and when you awake, they will talk with you. Psalm 37:31—The law of his God is in his heart; his steps do not slip. Psalm 40:8—I delight to do your will, O my God; your law is within my heart. Psalm 119:16 —I will delight in your statutes; I will not forget your word. Some children have a greater affinity for memorizing scripture than others. It is sweet, pure, protective, edifying, saving grace and truth that bubble up from the recesses of his mind whenever needed. Memorized scripture coats a child’s heart, serving as a barrier against sin in his life. Heart-captured scripture is a fierce weapon that can be unsheathed in an instant when spiritual battles rage. Though some may surrender the art of memorization for the ease of a Google search, Dayspring will continue this practice as part of the bold, distinct, and biblical education Dayspring Christian Academy offers.